June 19, 2006 – Duane Roland was born on December 3rd 1953 in Jeffersonville, Indiana and moved to Florida at the age of 7. Music was evident in the Roland home – Duane’s dad was an occasional guitarist, and his mom was a concert pianist. Duane originally played drums in his first band, at high school, before gravitating to the guitar. Duane originally tried to put a band together with Banner Thomas, and Bruce Crump but it didn’t really work. He made his name in Florida as a guitarist with The Ball Brothers Band. When The Ball Brothers split, Duane filled in for Dave Hlubek with Molly Hatchet when Dave was unable to make a gig. He was in!! The band had originally formed around Jacksonville, Florida in 1971 and taken their name from a 17th century prostitute who allegedly mutilated and decapitated her clients with a hatchet. 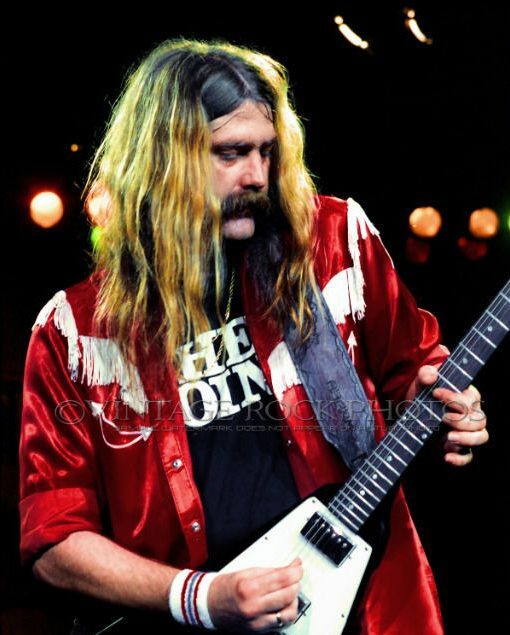 Molly Hatchet was formed in 1971 by Dave Hlubek and Steve Holland. Danny Joe Brown joined in 1974, Duane Roland, Banner Thomas, Bruce Crump in 1975. When they finally got their recording contract with Epic they got some help and advice from Ronnie Van Zant, who was originally suppose to produce the album, but was unable to due to the tragic plane crash in ’77. Because of this the band’s debut was not released until late 1978. Fortunately for the band, this late delivery did little to deter their popularity. By the time their second record was released, the band had became enormously popular and stayed that way for many years despite the departure of vocalist/frontman Danny Joe Brown. Brown left the band in 1980 due to health problems stemming from diabetes. Others have stated that the band worked hard on the road, and drank just as hard, which was the reason that Brown had to go. Brown returned to the band in ’83 for a successful tour and the release of “No Guts No Glory”. They recorded and released their first album, “Molly Hatchet” in 1978, followed by “Flirtin’ with Disaster” in 1979. They toured behind the album building a larger fan base. He recorded seven albums with the band and is is credited with co-writing some of the band’s biggest hits, including “Bloody Reunion” and “Boogie No More”. During his stay, he was famous for his ability to nail his lead spots in just one take. He was actually the only member of the classic lineup to appear on all seven albums. The only song he didn’t perform on was “Cheatin’ Woman”. He also co-wrote a great deal of classic Molly Hatchet music. Duane appeared on the 1989 album “Junkyard” by the band of the same name. At the time he left in 1990, he was the owner of the Molly Hatchet brand. The agreement in the band had always been that the last man standing got the name. Duane then quit music for almost a decade and ran a company in the field of office machine repairs and later became a call centre supervisor with an Internet company. Duane was the only Hatchet original to not play in the Dixie Jam Band during Jammin’ for DJB. Riff West (the shows organiser) sites “legal difficulties” as the reason Duane did not perform. He did however, lend his talents by added his guitar tracks in the studio. Duane Roland sadly passed away at his home in St. Augustine, Florida on Monday June 19, 2006. He was 53, and his death was apparently from “natural causes”.